“Ken is the real deal. His picks are great…he is constantly teaching. The small “one-liner” teachings that he is constantly sharing with us in the trading room are extremely valuable. 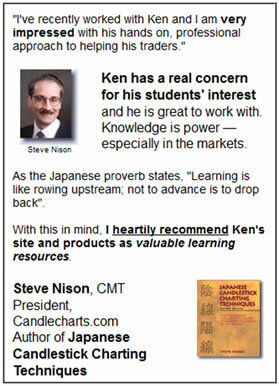 You can learn a lot in a very short time.” – Kevin W.
I’m confident that if I had come under Ken’s coaching earlier in life, my bank account would be much healthier, but I am grateful for the good information that I have received, his courses are well worth the investment of time and money.” – Ted C.
“I have been studying under Ken for the past 4 years and the improvement in my trading knowledge and skills has been VERY significant. I look back on when I began trying to do this on my own and I have to just laugh how I had no idea what I was doing. Ken taught me so many valuable things – how to scan for worthwhile stocks, position sizing, tape reading, precise entry and exit points,gap and technical analysis etc etc – too many to list here. His honesty, knowledge and training ability are unsurpassed in this industry. His professionally done webinars are priced very competitively, packed with excellent trading lessons, recorded in high quality Blu-Ray, and I constantly find myself going back and reviewing them over and over again. And he takes time to answer your questions. Trading is very difficult. I think what I like about Ken the most is he is a straight shooter. And whether you are a beginner or an advanced trader, Ken’s experience as a real trader will certainly help improve your knowledge and give you a better edge to be successful. Thanks Ken! !” – Bud S.
“I appreciate all of the time and training you make available at such reasonable prices to help make us better and more insightful traders. I have learned a lot through all of the courses I have had with you. I especially appreciate the explanations of your thought process as you make your evaluations and suggested entry and exit targets. These have helped me the most…If there is one thing that amazes me it is that your methods have stood the test of time..” – Mark K.
Ken, Thank you so much for calling and talking to my wife yesterday. I was, and still am, sick. I want you to know how much I have appreciated your teachings – you go way beyond what anyone else does – you care about your students, and that is very apparent and so very important!… For now, I wish you the very best and thank you for so generously sharing your wealth of knowledge with your students (me, in particular) in TTO and in the various courses I’ve taken from you…” – Michael P.
“You put your reputation on the line by providing entry and exit points. Larry D.
It’s hard to pick just one thing I like best about you Ken. You give excellent value with your teaching. You explain your subjects clearly, are easily understood, you are encouraging and have proven over and over again that you know what you’re talking about. You ARE a real trader who enjoys and wants to help others become successful traders. You invite feedback and questions from your students. I have learned a great deal from your solid teaching. Thank you, Theodora A.
You’re an excellent teacher and I’ve learned a lot from your videos. Your “Transform Your Trading” series was just what I needed to begin recognizing and correcting my bad habits, and start thinking like a professional trader. You work super hard for your students. I emailed a question at night on a holiday not expecting a response until after the long weekend. Not only did I get a response within minutes, but it was directly from you! I was so surprised! Your accessibility and quick response left quite an impression. Domingo M.
“Your trading room is absolutely outstanding and the most professional I have been in to date. I subscribed to your room in order to get a glimpse into how professional day trading is executed…I have been a member in two other trading rooms and yours is the absolute best” Michael P.
You really have gone above and beyond in responding to my product shipping e-mail. THANK YOU for the personal attention. I AM IMPRESSED!! I didn’t mean to tie you up but i appreciate the follow up.. Doing stuff over the internet is so scary cause you usually get no response and can never get to a live body. Anyways – learned a lot from the ADX webinar, hope there is even more info on the ADX Mastery Disc. I am really looking forward to your teaching, as I need to restore my confidence as I have made every rookie mistake possible and then some! Can’t make the webinar tonight but will watch it later. Anticipating much success going forward with your and Steve’s teachings. Thanks again, Michael C.
“Thanks Ken for a great webinar on trading the open!! This will definitely help my trading.” Rex M.
“This was the second Daytrading University webinar that I’ve attended and it was again full of excellent step-by-step practical advice that I’ve started using already. Ken was extremely professional and generous with the Q&A session at the and I get the feeling that he genuinely cares about his trainees learning and becoming better traders. Well-worth the investment, what I learned has more than paid for the cost of the training within a couple of days already.” Richard B. ” Ken is a fantastic teacher who is full of energy and willingness to share. He is also a very good trader as he demonstrates with live trading, unlike other “gurus” who show you from charts of past trades. Ken is also my most trusted teacher because he never ignore my emails for help. In fact, I lost all my video files from one of his course because of a hard disk failure and when I asked him if I could download the whole course from one year ago, he immediately gave me links to the files I needed. He is a very generous guy who treats his students with care and always doing his best to help them do well in their trades. I highly recommend Ken Calhoun to anyone looking for help in learning how to trade better.” Henry G.
““I wanted ken to know his day trading class is better than any one I have attended and his trading room is also the best instruction I have seen. I am attending his up coming scanning class and that is where I need to learn more. How to make a short list of stocks to trade. How does Ken come up with his short list in the trading room. Thanks” David A. ““Thanks Ken and just to let you know my trading is turning around for the 1st time since I discovered you and your strategies. Thanks again” Robert M.
““I have been a fan of yours for more than ten years…I have recently purchased both the Swing Trading and Scanning training sessions and continue to learn from these excellent training sessions. I consider you to be the very best at what you do. You are both entertaining and an outstanding instructor at the same time. 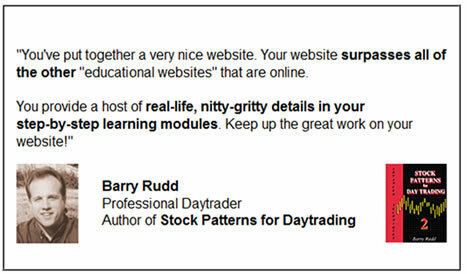 Plus, see another 102 testimonials on the bestselling StockTradingSuccess.com System page that I co-produced with Steve Nison. It’s important to make sure that whomever you’re buying educational materials from has lots of video and other testimonials, so that you can see how satisfied other traders are.